Rushe Golf LLC has spent the last five years developing and patenting a unique training product for golfers. This product will soon be available for golf professionals and golf fitness specialists to train golfers to "feel" what it is like use their lower body properly on the downswing and maintain posture. Eanna has a bachelor’s degree in business administration and a master’s degree in sports science. Eanna is certified from the Titleist Performance Institute (TPI). 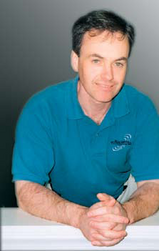 He is also a certified strength and conditioning specialist (CSCS) and a certified medical exercise specialist (MES). Eanna was the technical advisor on golf biomechanics and conditioning for the book “The Six-Spoke Approach to Golf” by Tom Patri, PGA. Eanna has been featured on the CBS Early Morning Show with Maurice DuBois, on Connecticut Public T.V., on NY1 News and on Greenwich local radio. He has been featured several times in Suburban Golf, Greenwich Magazine, and Greenwich Time. Eanna also does a golf fitness/biomechanics segment for the PGA Tour Network on satellite radio. BioSport Technologies LLC, is a sports analysis and training facility in the New York and Connecticut area. BioSport helps golfers of all abilities with their golf game using the latest swing analysis technology. We also work with baseball players, tennis players and many other athletes utilizing advanced technologies for analysis. Based in Greenwich Connecticut, our facility can apply biomechanics principles using our state-of-the-art 3D Biomechanical Analysis providing data for performance enhancement.